When the Broncos and Seahawks meet on Sunday to kick off their respective seasons, both teams will be undergoing reinventions of sorts. 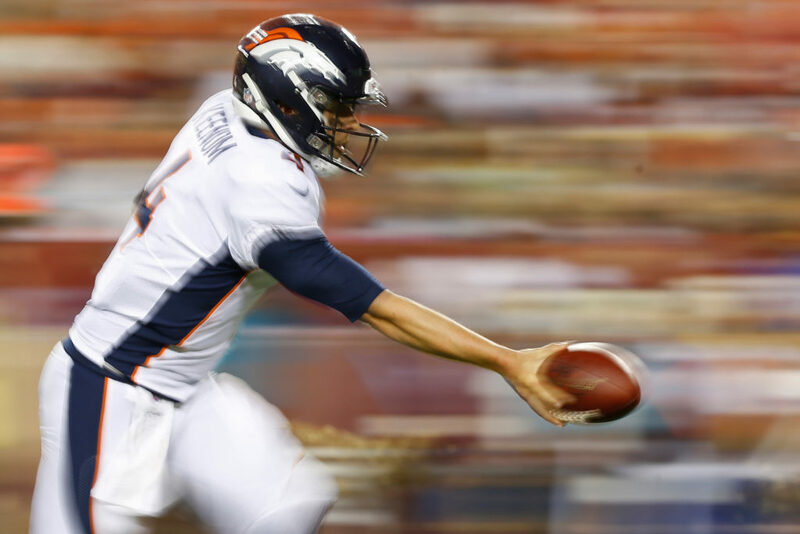 The Broncos, after adding quarterback Case Keenum in the offseason, look to revitalize their moribund offense after a 5-11 season that saw consistent ineptitude place their defense in impossible situations. The Seahawks have been trying to stay afloat during an extraordinary exodus of talent over the last few seasons that has them in uncertain position despite having one of the league’s very best quarterbacks — Russell Wilson — at their disposal. The Broncos lead the all-time series 34-19, with most of those games played as AFC West rivals prior to the 2002 season, but recently, the series has evened out — the Broncos are 5-4 against Seattle since 2000… in the regular season. Broncos fans, of course, remember the humiliating 43-8 beatdown Seattle gave the Broncos in Super Bowl XLVIII. HOW THE BRONCOS CAN WIN: Denver’s defense obviously needs to contain Wilson, a dynamic talent that can flip the script of any game if given the opportunity. With a suspect running game, expect Pete Carroll to leave the ball in Wilson’s capable hands for most of the game. On offense, Keenum’s ability to get the ball to playmakers Demaryius Thomas and Emmanuel Sanders is critical; the more often that duo ends up with the ball, the better off the Broncos will be. Rookie running back Royce Freeman and a revamped offensive line (yes, again) will need to convert third downs with power runs in order to keep Wilson and Co. off the field. HOW THE SEAHAWKS CAN WIN: Wilson will need the running game to take some of the heat out of the Broncos’ relentless pass rush behind Von Miller and rookie Bradley Chubb. It’s important for the Broncos not to over-pursue Wilson, however; he’s most dangerous outside the pocket, so rookie Chubb, in particular, can’t let the excitement of his NFL debut get the best of him. Defensively, if the Seahawks can put consistent pressure on Keenum and keep him in the pocket, the smallish quarterback will have difficulty pushing the ball down the field. If Seattle’s front seven can stifle the Broncos’ burgeoning running game, they can makes the Broncos one-dimensional in a hurry. Broncos LB Von Miller: The straw that stirs the drink, Miller will likely line up against Seahawks tackle Germain Ifedi, who led the NFL in penalties last season. Seahawks S Earl Thomas: Seattle’s all-world safety reported only days ago… but it probably wasn’t to show up and not play. A terrific all-around player, Thomas’ ability to contain the run and defend the pass in invaluable — if he’s in game-shape. Broncos CB Bradley Roby: The former first-round pick takes over for Aqib Talib, and while no one expects him to play at that level immediately, the Broncos need him to be close to it. Expect Roby to be picked up all day opposite Chris Harris Jr. until and unless Roby proves that he’s capable. Seahawks RB Chris Carson: He’s keeping the seat warm for first-round pick Rashaad Penny; if Carson can’t be effective against a tough Denver front seven, Seattle could be in for a long day. Broncos WR Courtland Sutton: A standout from the beginning of training camp, the enormous — and enormously talented Sutton is the Broncos’ X-factor on offense. Even if he’s used judiciously, Sutton’s steady hands and leaping ability can significantly impact the game. Seahawks CB Dontae Johnson: In a similar situation to Roby, teams would rather challenge Johnson, who’s returning from a broken foot, then Shaquill Griffin, who had an outstanding rookie campaign in 2017.